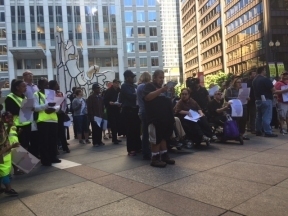 Access Living and Centers for Independent Living across Illinois participated in a vigil to address the budget impasse, which has affected thousands of families across the state. The vigils were intended to send a message to state politicians that “Illinois need a budget now.” The vigil took place in downtown on Tuesday evening with several participants. Access Living is owed more than $500,000 in State Contract Money that has not been paid because of the Budget Impasse. Each month, Access Living spends $60,000 in reserves in order to continue providing contracted services. As a result, Access Living has been forced to cut staff, leave positions unfilled, and reduce services. 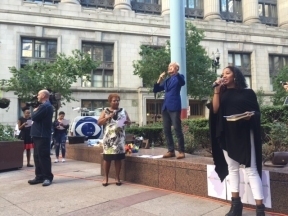 At the vigils, advocates recognized the programs that have been destroyed by the budget crisis and the people who have lost services, and will call on Illinois to pass a budget.